You can easily attach files to your tasks from Google Drive, Microsoft OneDrive or Dropbox. Attach files from Google Drive to your tasks. You can also add files from Team Drive. Go to the task where you want to upload files, click "add files" , choose "Google Drive", select the files you want to upload and click "post". Attach files from Microsoft OneDrive to your tasks. You can also add files from Sharepoint. 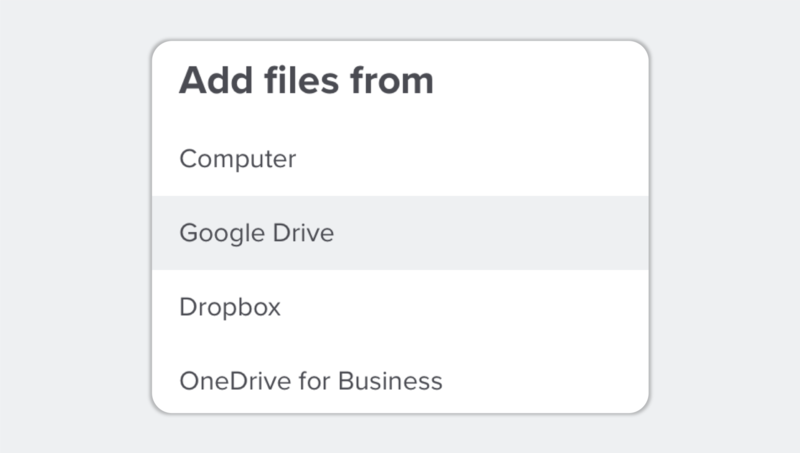 Go to the task where you want to upload files, click "add files" , choose "OneDrive for business", select the files you want to upload and click "post". Attach files from Dropbox to your tasks. Go to the task where you want to upload files, click "add files" , choose "Dropbox", select the files you want to upload and click "post".